A word of warning: Google for the definition of the word “pummer” at your own risk. Rest assured that this beautiful solar-powered circuit sculpture fits the only definition of pummer that we care to deal with. For the unfamiliar, a pummer is a device from the BEAM style of robotics, a sort of cyborg plant that absorbs solar energy during the day and turns it into a gently pulsating light that “pumms” away the dark hours. [Mohit Bhoite]’s take on the pummer is an extraordinary model of a satellite executed mainly in brass rod. His attention to detail on the framework boggles our minds; we could work for days on a brass rod and never achieve the straight lines and perfect corners he did. The wings support two solar cells, while the hull of the satellite holds a dead-bugged 74HC240 octal buffer/line-driver chip and all the other pumm-enabling components. A one farad supercap – mounted to look like a dish antenna – is charged during the day and a single LED beacon blinks into the night. Hats off to [Mohit] for a top-notch circuit sculpture. We’ve seen similarly detailed and well-executed sculptures from him before; something tells us this won’t be the last. Thanks to [Varun Reddy] for the tip. Getting a solar array to track the sun has always been an interesting problem, and it has led to some complicated solutions. Controllers that use GPS and servos seem to be much in favor these days, but as this NASA-inspired sun tracker shows, the task needn’t be overly complex. It’s pretty obvious from the video below that [NightHawkInLight]’s solar tracker is just a proof-of-concept for now, but it certainly shows promise. It’s based on NASA’s sun-skimming Parker Solar Probe, which uses sensors at the rear of the probe to maneuver the craft to keep sunlight from peeking around the sides of the shield. [NightHawkInLight]’s design simplifies that scheme even more, by using solar cells as the four sensors. The cells, mounted behind a solar shade, are directly connected to small gear motors that control azimuth and elevation. When a cell sees the sun, it powers the motor that moves the panel the right way to occlude the sun again, thereby cutting power to the motor. [NightHawkInLight] mentions the obvious problem of what happens when the sun comes up and the array is pointing the complete opposite direction after the previous sunset, but we’re still not sure his solution – a larger array with tracking cells mounted further apart – will work. We’re also not sure how it will scale to larger arrays that need bigger motors to move. We’ve seen such arrays handled with more complicated trackers, of course, but we hope the simplicity of this design can be made practical for real-world use. Looking to add a little pizzazz to your back garden? Are those strings of lights hung in the trees looking a little dated? Why not try lighting your garden path with DIY solar-powered pavers? If [jfarro]’s project looks like a miniature version of the much-touted solar freakin’ roadways concept, rest assured that there are huge differences. For one, these lighted pavers actually work — trust me on this; I live not far from the demo site for the Solar Roadways and the degree to which it underwhelms cannot be overstated. Granted, a garden path is a lot simpler to engineer than a road, but many of the challenges remain. Using recycled glass blocks that are usually reserved for walls and windows, [jfarro] figured out how to attach Neopixel rings to the underside and waterproof them with a silicone conformal coating. The 12 lighted pavers he built draw considerable current, so a 45-watt solar array with charge controller and battery were installed to power the pavers. An Arduino and a motion sensor control the light show when someone approaches; more complicated programs are planned. Hats off the [jfarro] for taking on a project like this. We don’t often see builds where electrical engineering meets civil engineering, and even on a small scale, dealing with dirt, stone, and water presents quite a few challenges. Here’s hoping his project lasts longer than the Solar Roadways project did. 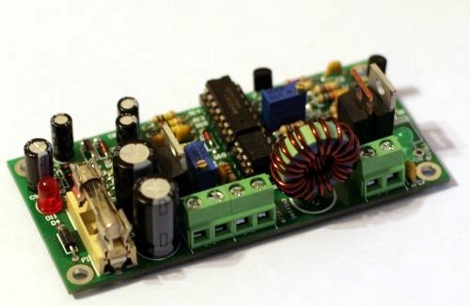 Make your next project solar-powered with this charging circuit. It’s completely through-hole, and there are no microcontrollers that need to be flashed. If you can source parts and are handy with a soldering iron building this will be a breeze. Both the maximum system voltage and the low voltage drop out are configurable. After assembly, you just need to attach a regulated power supply to the load terminals. Tune the power supply to the max voltage and turn a potentiometer until an LED comes on, then repeat the process for the drop out voltage. Board artwork for the two-sided PCB and a schematic are available from the page linked at the top. If you’re not into etching your own circuit boards you can buy one for around $10.